But what about the other factors that went into making that completed product, the people, the late night meetings and code that needed debugging at 4am? Although some could say this is part of the development process, one could certainly view development as being encapsulated within this ‘Innovation’ term. Through continuous development we can achieve innovative solutions. (a) What am I introducing? (b) Who am I introducing it to? (c) Is my ‘new thing or method’ helping/solving/refining/addressing? (d) Can I leverage technology to help me? (e) Can I be innovative in being innovative? 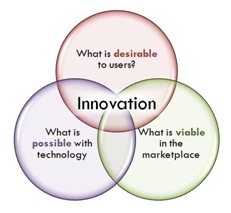 So we have a definition of innovation and some things to think about during the process. It seems simple enough, and is a little bit of an oversimplification, however not as much as you’d think. But it involves a fundamental change in focus for many people. If more of us continually ask ourselves or our organisations these 5 things each and every day we may well achieve more as individuals, as companies, as a sector and, in fact, see New Zealand climb the global innovation stats on the back of an innovative ICT sector. So no matter where you are….. always remember…. Its never to late…..to Innovate!